In the hit Broadway musical “A Chorus Line,” one of the performers sings a plaintive song about her escape from harsh reality by performing ballet. Well, not to be too dramatic, but Mayor Vincent Gray is dancing as fast as he can in sort of his own ballet as a federal investigation inches forward. Last week, Washington City Paper’s Loose Lips columnist Alan Suderman wrote a cover story on the mayor’s almost-frantic adherence to a routine mayoral schedule to prove he’s not distracted by scandal. And on Wednesday every city hall reporter suffered through more than an hour of the mayor’s latest rollout, a glossy, 60-page handbook on all the dramatic -- there’s that word again -- things he is doing and will do as mayor. The booklet includes eight pictures of the mayor hard at work. Looking closely, the booklet is filled with goals that you might think any mayor would have. “Recruit, hire and train police” is one example. “Modernize all public school buildings” is another. (We wonder what Adrian Fenty thinks of that one.) “Decrease theft of smartphones and other devices.” We’re looking forward to learning how much the government can accomplish on that one. A routine, bi-weekly news conference by D.C. Mayor Vincent Gray ended in a shouting match between reporters and the mayor's press secretary. The mayor tried to focus on his government plans. Reporters were asking if the mayor was trying to distract attention from the federal investigation into his 2010 campaign. Tom Sherwood reports. More than a half-dozen senior administration officials were standing behind the mayor, listening intently. Three of them were designated to step forward and read glowing accounts of how hard everyone is working and what a great job the mayor is doing. “Today we continue to build upon great progress made over the last 18 months,” intoned Victor Hoskins, the deputy mayor for planning and economic development, setting the tone for the next speakers. The Notebook can hear supporters of the mayor pounding on the table in frustration. Isn’t the mayor doing what he’s supposed to be doing, rallying the whole government? And aren’t there some real initiatives in there for improving special education, environmental sustainability and job development? Doesn’t the mayor mean well? The point is not that the mayor isn’t doing many good things. Ardent supporters of former Mayors Fenty and Anthony Williams are pleased that Gray is focused on economic development and education when many feared he wouldn’t be. For example, last Thursday, the mayor presided over the groundbreaking for a desperately needed health clinic in Ward 8. But all of this good news is occurring on a shaky stage that could fall at any time. Federal prosecutors are grinding away like termites, discovering fresh evidence of the massive conspiracy carried out to help elect Gray in 2010. No amount of positive spin on what the mayor is doing will wipe away this deadly fact. The mayor won’t explain publicly either how his campaign -- to his shock -- went off the rails, or what his role was in his own flawed election. We guess the prosecutors will soon. And then, there may be another ballet performance. Many think he might cue up a swan song. • Crowd control. 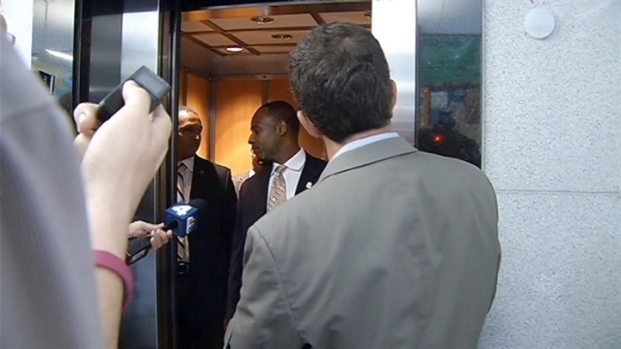 NBC4 also reported last week that the mayor’s security detail -- after expressions of concern from the chief’s office -- is stepping up its effort to create a little more space between the mayor and the swarm of reporters now surrounding him with every scandal development. Don’t be shocked, but most reporters think it’s a germ of a good idea. It certainly makes for good television when reporters are hounding a mayor or other official as he escapes into an elevator or behind a closed door. Some viewers at home see the official on the run, a pack of journalists nipping at the heels. Other viewers see a rude, unruly mob. Whatever your characterization, reporters chase someone because there’s news to be made. Last week, the mayor turned his biweekly news conference into the bureaucratic breast-beating marathon discussed above. But the mayor’s own written agenda showed that the event was to conclude with general questions on any topic from the reporters. The mayor took exactly two such questions before bolting from the room. When reporters angrily complained, his staff said the mayor had answered questions for an hour and 20 minutes. Reporters pushed back, noting that 70 of the 80 minutes were on the mayor’s topics, not theirs. Gray and most mayors are generally available to the press at public events or when coming to and going from the Wilson Building. But every mayor we’ve ever covered has tried various ways to escape the local media. Sharon Pratt once refused to get out of her car as we stood in front of it. Such evasive tactics never work. Let’s repeat that: They never work. Reporters can be civil, and reporters can wait to ask questions of a mayor. But if they feel that someone is ducking them, then all bets are off.